Getting a spin bike for the home can be a great time and money saver. When you workout at the gym it can be difficult to get there for the time they run classes and if you go out of class time it can be difficult to get a bike or the one you want. 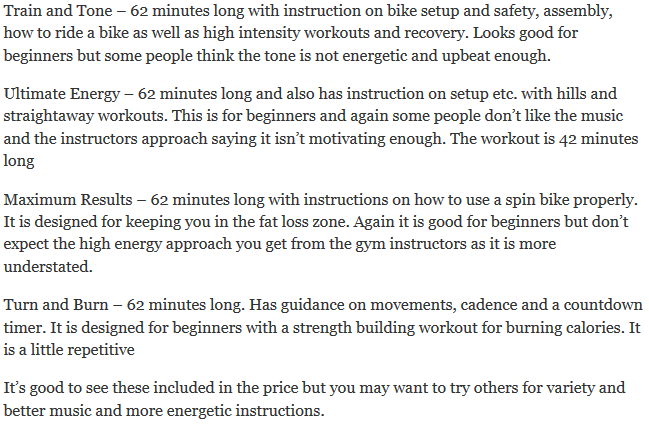 These are just some of benefits of buying a spin bike for the home. The company Spinning have been making spin bikes for home and commercial use for a very long time. They have just released the Spinner S1 for those who want their own bike to use at home. It updates and replaces the previous model the Spinner Fit and is a entry level spin bike for those who want to take their fitness more seriously. In our review we look at just how well this bike brings quality gym to your workouts at home. The first point is to look at the durability and stability of the bike. The bike is made from heavy steel tube to give the base for a bike that stays in place while you workout. The bike is solid and there is no flexing or rocking from side to side when you are pedaling hard in the saddle or standing. It holds firm when you are jumping in and out of the saddle so there isn’t any concern of it tipping. You can just get on with the joys of exercising. The bike has 31 lbs perimeter weighted flywheel. This gives a natural riding feel with the weighting on the perimeter helping to give it the momentum needed to prevent the pedals slowing down as you pedal or it feeling like you are in the wrong gear. It won’t be as natural as you get with heavier weighted flywheels but for beginners and for moderate exercise levels this will provide a good riding experience. (Heavier flywheel bikes do tend to cost more). Underneath the stabilizer bars are leveler feet that can be adjusted to prevent any wobbling on uneven floors. As well as being sturdy you want the bike to fit you comfortably and properly so you can get an efficient workout that reduces the chances of injury. The Spinner S1 can be adjusted to fit people between 4ft 10 ins and 5 ft 10 ins. The adjustment process can be completed in less than a few minutes making it suitable for multiple users. It uses pop-pin knobs and adjustment poles with pre-drilled holes to make the adjustments. You loosen the knobs and pull on them and slide the poles into position and then tighten them up. The seat can be adjusted vertically and horizontally but the handlebars can only be moved upwards and downwards. This might cause a problem with people with short or long torsos as they won’t be able to position the handlebars correctly to fit them causing cramping or stretching but the majority of people will be able to find the correct and comfortable position. The pop-pin adjustment knobs do need to be tightened up properly to prevent any shaking of the seat and handlebars when you are using the bike. It doesn’t have any markings on the poles which make it a little harder to fit it back to your settings when someone has moved them, but you can count the holes to help with finding or maybe mark your position with a marker pen on the pole. The bikes uses a pad that sits on the top of the flywheel to provide the resistance needed to simulate hill climb workouts. The pad is protected by a guard which prevents sweat dropping on it – prevents corroding of the fittings and the flywheel. The resistance is continuous and consistent. By turning the tension knob at the top of the frame the resistance can be increased or decreased. There are no levels marked to let you know how hard you have adjusted the resistance to, which can also make it difficult to return to a previous setting – you have to use feel to estimate where to turn it to – this is standard for most spin bikes. If you are used spin bikes through using them at the gym you may find that the resistance increases with less turning of the knob. It can take a little getting used to but the increases are incremental and you don’t find yourself going from easy to very difficult with just a small turn. If you need to stop the flywheel quickly you push down hard on the tension knob and it works like a brake. The bike has a chain drive. It gives a similar feel to that you get with an outdoor bike. But this also means you get the same issues. It requires maintenance. The chain will need lubricating from time to time as well as tightening to keep it running as quietly as it can and ensuring you get a good pedaling motion. Both of these things do not take a lot of time and don’t require any specialist tools or knowledge. The manual has good clear instructions on how to do these jobs. When you receive the bike the chain should be tightened and lubricated but if it making a loud clanking noise it may need to be adjusted and it is worth checking with Spinning to get it sorted. When working properly it does make a noise but it is a low clinking sound of the chain moving over the sprockets – it will be similar to the noise you experience with an outdoor bike. The chain has guard around it to protect it from getting sweat dropped on it plus it stops your ankles, feet and clothes from getting caught by the chain. If you think the bike is going to be too noisy for you (it’s not loud), the alternative drive type that is quieter is the belt drive but these normally cost more. The only bike in this price range is the Sunny Health and Fitness Belt Drive Indoor Cycle which costs about $100 less currently with a heavier flywheel at 49 lbs. The heavier flywheel can be harder to get started but gives a smooth ride and the belt drive is quieter and requires less maintenance. It does have a fixed gear which means that while the flywheel is moving so are the pedals. The flywheel continues to move due to it weighting and pulls the pedals along with it when you stop pushing them. You can’t coast or take it totally easy when you reduce the resistance. You also need to be careful when you want to get off that the pedals have stopped turning to prevent injury. The pedals are toe cups that you place your feet into and tighten up the strap to give you a good grip on the pedal when pushing and pulling. It takes standard athletic shoes and your feet don’t move around and feel secure whether you are pedaling sitting or standing. They won’t take specialist shoes with cleats, but the bike will fit other standard size bike pedals so you can change them for these if you want. Seat. The seat is wider and more padded than a standard bike seat so you may find it easier on your sit bones but this is not a definite thing. It is the same with any bike seats not everyone finds a particular seat comfortable. If you don’t like the seat you can fit one that you prefer as it fit standard size seats. Also you could try padded bike shorts or a gel seat cover. Noise. This is a reasonably quiet bike and won’t make too much noise but you will hear the resistance pad rubbing on the flywheel and the chain clinking. It is a low level background noise and won’t interfere with your workout enjoyment (I not sure if that is the right term to describe an intense workout). Also others in the house are unlikely to be disturbed by it too much except when the house is still. Dust and Dirt. As with all chain drive and friction resistance pads the bike is going to drop lubricant and dust. You may also drop sweat on the floor. All these things can damage your floor. A rubber exercise mat is enough to prevent damage to the floor. it also helps reduce noise and scratching if the bike moves. Handlebars. The handlebars are designed with spinning in mind – with you able to place your hands in the classic 3 positions – in the center, shoulder width apart and gripping the ends of them when pushing hard and out of the seat. The bars are coated to make gripping them easier and to avoid blisters when your hand get wet. The bars are not padded sufficiently to protect your elbows if you intend leaning on them when sprinting etc – you are probably going to want to buy elbow pads to save your arms from too much hurt. Riding Position. These bikes are used in a similar position to an outdoors bike, with you sitting upright and leaning forward on to the handlebars without support for your back so if you do have back issues you may wish to consider other exercise bike types for your exercise. When the bike is not in use you are likely going to want to move it and keep it out of the way. The bike weighs 96 lbs which could have presented a problem with moving it, but it comes with transport wheels at the front that you tip the bike on to so you can wheel it to where you want. They are strong enough to hold and have good clearance so they should work well on all surfaces including carpet. If you have wooden floors you might want to check the wheels don’t scratch or dent it first. It needs an area of 60 inches by 20 inches for storage – it probably would fit best against a wall or if you have a big cupboard it might fit in there. The bike is delivered partially assembled for shipping purposes. Completing the assembly should take less than an hour. It comes with everything needed to complete the process including the tools. The frame and flywheel are together so you are left with attaching the stabilizer bars, seat, handlebars, adjustment poles and pedals. The process is described in the manual which is simple to follow along to. The hardest part is likely to be handling the weight at the beginning, you may find it easier to have 2 of you to put it together especially when moving the box and putting the bike on to the stabilizer bars. The bike does not come with a console. This is not unusual for spin bikes especially at this price. The ones that do have consoles are basic and measure items such as speed, RPM, calories, distance traveled and time elapsed. Not everyone wants a console and they are happy to spin or train to a DVD or YouTube video using the music to keep their cadence (RPM) to the level needed for their workout. If you are keen on knowing your numbers for motivation and tracking progress you can add a cycling monitor from Cateye which can be bought for less than $25 but you do need to make some adjustments to it to get it to fit. People have done this for other bikes. It involves modifying the spoke magnet that comes with it so it will fit on the flywheel. You do get something extra than you normally do with spin bikes, which is in addition to the water bottle holder. The water bottle holder itself is situated in the middle of the frame. It is easy to reach but may get wet from sweat dues to this positioning. As the bike has only been recently released there have been no customer reviews left at the moment. A similar model the Spinner Sport – it is a lighter and smaller bike – has had a mixed reception on a total of 5 reviews – one customer is not happy with the quality of the build, and one was mentioned the chain rattling but others have enjoyed it and like the quality. The S1 is a heavier bike and has a wider base so provides a sturdier base for the workouts. They liked the build and there was no mention of the chain being noisy. The S1 does have everything needed for a good ride for beginners getting started and those wanting moderate levels of exercise rather than full on intense workouts for very dedicated and experienced spinners and trainers. It is priced for those that are looking to get started in spinning. The DVD’s it comes with, when I checked, cost about $60 on Amazon which is a good deal. You get a no frills bike for the price form a company with years of experience in building bikes for gyms and homes – so they do know what they are doing. When I checked the price it qualified for free shipping and Prime at Amazon. The bike makes a good place to start for those new to spinning or training and for those who want moderate to intense exercise. Those with more experience may find it not to their liking because of the light flywheel and the lack of a console but to get more suitable bike it is going to cost more (See Spinner NXT if you want to stay with this brand – it’s good for beginners too). For those starting it provides a good stable ride, easy to adjust resistance to increase the intensity levels for building strength and endurance. The 4 DVDs included, although not to everyone’s taste, provide you with 4 good programs to get you started too). It is backed by a company that know spin bikes and have been doing it for years which gives you some assurance this bike will also stand up to years of use.